Infants are utterly helpless and dependent on you. They have no ability to self-sooth, no self-control, can’t modulate what they feel; it’s not easy for babies. Life is an ocean of sensory information that comes in continually; infants’ minds are working overtime to help them categorize, sort and interpret all of this data. (That’s part of why babies sleep so much; their brains are processing what they’ve experienced up to that point, and begin converting data and patterns from short to long-term memory). 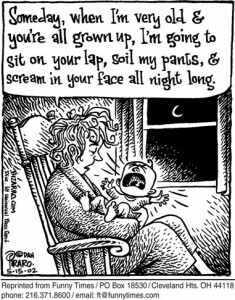 A baby’s experience of the world is often overstimulating. Parents, on the other hand, are adjusting to entirely different lives. Once a baby is born, you are no longer the most important person; someone else now needs both of your love, support and attention even more. I’ve been told by many parents that having a baby is humbling, inspiring, and forces your ego to take a back seat. Parents’ experience of the world can often be overwhelming. So what happens when an overstimulated baby and an overwhelmed parent get together? Honestly, that’s where some of the funniest stories can come from. That’s why I love this little comic! What happened the last time overstimulated clashed with overwhelmed?